Construction of Cabin Boy is now moving along briskly. Either I'm getting the hang of this, or I've gotten past the hard bits. Or maybe a little of both. After getting the planks on, it was time to work on the bottom. In the interest of finishing Cabin Boy as soon as possible, I decided to use 3/8" okoume marine plywood for the bottom, rather than the splined cross planks I'd originally planned on. 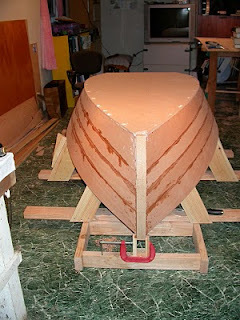 First, I laid the plywood sheet on the bottom of the boat. Cabin Boy's bottom curves a lot from fore to aft, so I weighed both ends down with a number of large art books. I always knew I'd find a use for those books. 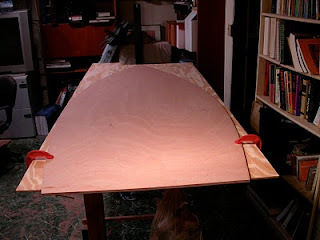 Then I carefully traced the lines of the garboards and transom on the underside of the plywood. I tried it on for size, and it fit perfectly. Note the books, fore and aft. I'd planned to fasten the bottom with 3M 101 sealant, backed up by silicon bronze screws, but unfortunately, 3M has discontinued this old reliable product. After doing a bit of research, I chose 3M 4200 as my bedding compound. This is similar to the popular 5200 sealant, but has much less bonding strength. 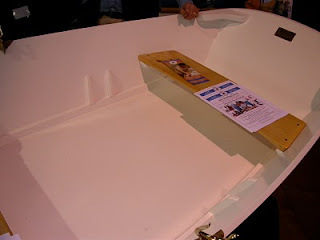 This allows the sealant to remain flexible and removable. I'm sure some people are thinking I should have epoxied the bottom, but I now have a bit of experience with both epoxy and flexible sealants, and it just seemed to me that the flexible sealant was a better solution for this big, critical joint. Bottom line, if the joint starts leaking with the 4200 in it, I can fix it by removing the screws and prying the bottom off. If the epoxied joint had a problem, I'm not sure what I'd do. I laid down a nice thick bead all around the edge and with Helena's help, carefully positioned the bottom on the boat, and screwed it down. I had some 4200 left over, so decided to fill the counter-sunk holes with it. Not sure if this is an approved use of the product, but it seemed like a good idea at the time. If it turns out to be a problem, I'll blog about it. So, putting on the bottom turned out to be easy-peasy. Hardly any challenge at all. I suddenly realized I was pretty vague about the next steps. 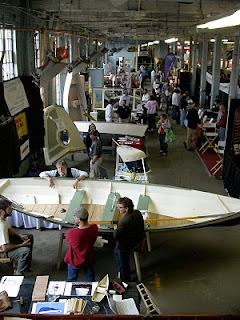 Lucky for me, this weekend happened to be the Maine Boat Builder's Show, in Portland. It was a great opportunity to check out the 'competition' (and steal some ideas), so I headed on up. 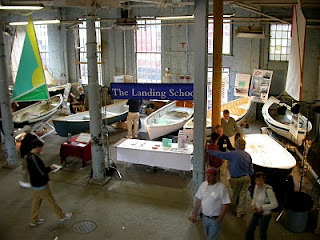 The show was held in the Portland Company's large boat yard complex. You walked through room after room filled with boats, not to mention all the 'accessories' that make boating and banking practically synonymous. My favorite finish is just plain linseed oil. I like the natural, work boat type finish, and even like the way it turns black after a few years. 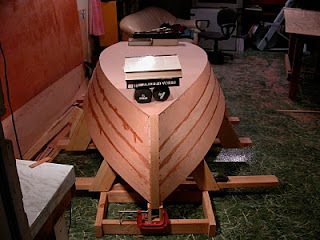 This is how I had planned to finish Cabin Boy, when I still thought I'd plank him in Cedar with copper rivets. But I didn't think this would work too well with epoxy-smeared plywood. But next time, this is what I'm going to do. My next favorite was a scheme I hadn't thought of: a two-tone combination, with a bit of bright work. Again, the result had the kind of no-nonsense, work-boat type look that I like. The bronze knees on the thwarts were a nice touch. I really like this boat. Almost as nice were the boats that were finished with one color, plus some bright work, like the two above. One boat I didn't particularly like was an 'instant' boat, finished all in white. 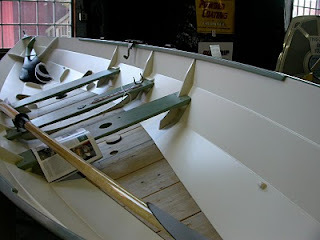 The color, plus the lack of structural details like ribs or seat risers, made the boat look more like a fiberglass than a wooden boat. Yes, I was born in the wrong century. So, the show helped me decide how to finish Cabin Boy. I'm going to use a two-tone color scheme, with a bit of brightwork... probably the inwales, which will be made of oak and shouldn't take much abuse. And the mahogany transom, of course. 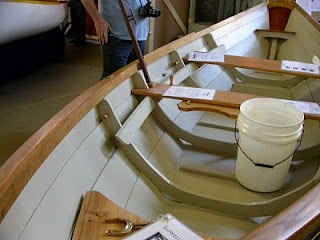 I also got some excellent ideas on how to build the gunwales, and seats. More on that later. 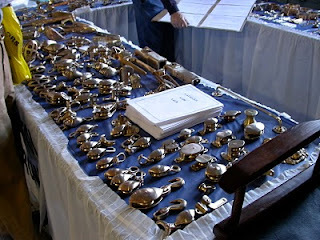 Finally, also of much interest were the few vendors who supplied traditional bits like bronze fittings (below), oars, rigging supplies, and rope that is meant to look and feel like traditional rope, but is made from modern materials. Eventually, I'd like to refit the Blue Moon with all bronze fittings and traditional lines and rigging. That reminds me... I must go buy a lottery ticket. So, a great show, and I was very impressed with Portland, itself. A nice city with a revitalized water front. Lots of restaurants, Irish pubs, and the young people who make them jump. Well worth a stop if you're cruising through the area. Tomorrow, I flip Cabin Boy over! The 4200 was a GREAT choice. You won't regret it. THANKS for all the boat show pics! Lots of good ideas and nice bling. I was just looking at the pics again... I had been thinking that if you built a good boat, it would look great by default, but I can see there is a good deal more to it than that. For the really nice boats, someone has spent some time working out the best way to paint it. There's a whole level of artistry that I hadn't appreciated before. It's interesting how much more I *saw* at this boat show. Nice post John. I will have to make plans to go to the Maine show next year and visit Mom at the same time, she lives in Addison and could join me for the weekend. 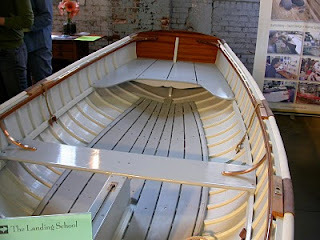 I am almost done with my interior and had been going to paint the whole boat white, but after seeing your pics, I will leave to top, rub, and inside rails natural along with the seat tops and casting deck just to show it is a real wooden boat and give some nice contrast. I have a little crome brightwork to add, can't afford the brass either. Glad the pic helped. I wish i'd been smart enough to ask about specific brands of paint. I'm guessing all the traditional looking boats used alkyd enamel, but I wonder what, specifically. Any ideas/recomendations? The way you made Cabin Boy's bottom is exactly the way that is described for the original wooden Optimist in the 70's. Nice job! As there was no Epoxy, we used water-resitant glue like recorcinol. 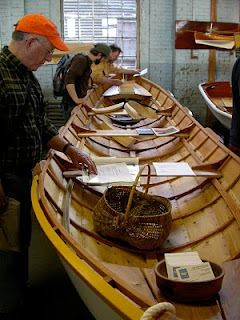 I ordered Greg Rossel's book on building small boats from the States and I think it's wonderful. You couldn't have a better teacher. He describes also the finishing of a boat like yours. Looking forward to your next post. Gerard: two minds on the same track... I re-read the chapters on finishing the interior, and painting, last night. You're right, its a great book. Only problem is, I now think I still have a lot of work ahead of me! "For the really nice boats, someone has spent some time working out the best way to paint it. There's a whole level of artistry that I hadn't appreciated before." Maybe you've just found another use for those Art books? I look forward with much anticipation to your reports. Great descriptions and pictures. I am reminded of a time some 50 years ago when I was a deck apprentice aboard a cargo ship. When we found in the hold some unclaimed sheets of plywood so three of us decided to build a boat. Tank tests for the design were conducted using a chart-paper model in the Second Mate's wash basin. The timbers were were scrounged from old dunnage wood, used to protect cargo. The only adhesive available was animal glue ( not very waterproof) and pitch, so a liberal coating of the latter was applied to the outside. On first launching the boat started filling up with Indian Ocean (we were at anchor off Karachi) then someone remarked that Noah (of Noah and Sons, Boatbuilder and Livestock Transporter)was told, when he was building the ark, to pitch it within and without. So we pitched it within and relaunched and lo, the boat was without water within! The mast was another problem - we chose to use green bamboo and very early on learnt that bamboo has little lateral strength, so took to carrying half a dozen spares whenever we went for a sail. Awaiting eagerly the next report. John- I am the guy who built the Catspaw Dinghy you liked, with the bronze knees. You only need a few key pieces of brightwork to really make a boat 'pop'. Yes, fabulous job on the Catspaw. I wish I had thought to ask you while I was at the show... what type of paint did you use?